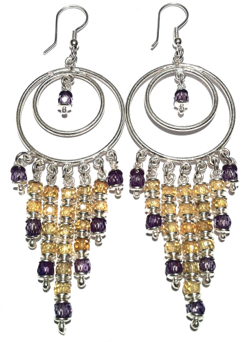 Modern style sterling silver chandelier earrings featuring 4 mm faceted cubic zirconia crystal beads in yellow and violet color. All silver parts are shiny and reflective. Tiny caps around cubnic zirconia beads give internal light to the crystal.